Angelo Curcio Jr., 66, died on Thursday, September 1, 2005 in Merry Heart Health Care Center, Succasunna, NJ. Born: On March 15,1939 in Easton, Pa, he was a son of the late Angelo and Susan Angelo Curcio. Personal: He was the husband of the former Joan Bova. Angelo lived in Panther Valley, Allamuchy Township, NJ since 1992, coming from Randolph Township, and previously had lived in Denville, NJ. He became an 8th grade social studies teacher at the Dennis B. O’Brien School, Rockaway Township, NJ, before transferring to the old Mt. Hope School as teaching principal. He moved to C.A. Dwyer School as assistant principal, ultimately moving back to Dennis B. O’Brien as principal where he finished his career, retiring in June 1992. He served in the Army from 1960 to 1963, and had attended the Army Language School in Monterey, Ca, where he learned to read, write, and speak Chinese, ultimately being posted in Okinawa with Security Forces. 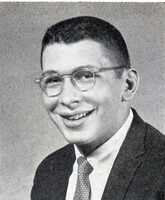 Angelo graduated from Easton High School in 1956. He received his B.A. in Economics in 1960 from Lafayette College and was a member of Chi Fraternity, and had received his Masters in Edu- cation in 1965 from Lehigh University. Angelo was first and foremost a family oriented person. He was also a good and true friend to the many people he interacted with during his career and beyond. He had courageously battled brain cancer since March, 1994. Most recently, he had attended his 45th reunion at Lafayette College and was looking forward to his 50th reunion at Easton High School. In 1954, he was cited as Outstanding Player at the Easton-Phillipsburg Thanksgiving Day Game. Survivors: In addition to his wife, Joan, he is survived by two sons, Patrick and Brian, both of Florida; a daughter, Madeline DeSimone and her husband, James of Hackettstown, NJ; two grandchildren, Anthony and Marisa DeSimone; and his mother-in-law, Mary Bova of Hackettstown, NJ. Services: Visitation will be on Monday from 2 to 4p.m. and 7 to 9 p.m. in the Cochran Funeral Home, 905 High Street, Hackettstown, NJ. A Funeral Mass will be held on Tuesday at 10 a.m. in the Good Shepherd Roman Catholic Church, Route 517, Andover, NJ. Interment will be private. Online condolences may be sent to www.cochranfuneral.com.